We are a leading Manufacturer of crescent lock for doors from Dombivli, India. 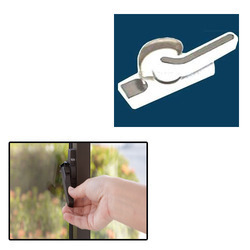 We are one of the widely acclaimed manufacturers and suppliers of Crescent Lock for Doors. The offered crescent lock is specially designed for locking the doors in homes and offices. Our supplied crescent lock is made from high grade metallic alloy, procured from very reliable vendors in the market. The offered crescent lock is available at very affordable market selling price. Looking for Crescent Lock for Doors ?